Frying Pan Comparison UK – Which is the Best Buy? Our frying pan comparison table 2013 blets you be the judge. Here, at a glance, are the best buy frying pans 2013 – as voted by buyers and users. Based on our survey results, you'll find the users’ overall satisfaction ratings per model – its marks out of ten - plus a run-down of the facts owners tell us are important – like is this frying pan induction hob compatible? Check out the best fry pans – as voted by UK users - from Castey, Le Creuset, Judge and Tefal. Sadly, no Green Pan, Multicook or Kitchen Craft pans made it into the top ten this time. In our quest to find the UK’s best frying pan, we’ve surveyed over one thousand seven hundred users. Our frying pan comparison table is based on the top 10 pans and four hundred and thirty one responders. Table © Best Buys Compared 2012-2013. *Overall users' satisfaction rating derives from all users for a particular frying pan. You can compare frying pans easily here. Which skillet or griddle pan can deliver you comforting fry ups, deliver an omelette, cook up a great sauce or offer a quick, healthy stir-fry? What you see here are the top 10 frying pans for 2013. What they give you is your kitchen’s single most useful cooking pan. No wonder the humble fry pan is the number one camping utensil. The best of the bunch, based on overall user rating is the Castey Vulcano skillet (User rating 9.87/10). The Vulcano has got the lot: It’s made of aluminium so offers consistent results, is non-stick, works on an induction hob and you can even take the handle off and shove it in the oven or under the grill. It’s also got sufficient depth to make it suitable for sautéing and sauce making. It looks good and will last for years. Are you on a budget? Yes? Check out the Tefal Sensorelle (User rating 9.61/10). It’s a no-nonsense frying pan made of aluminium for even heating and has a “thermo spot” to help you achieve consistent results. It, too, has a non-stick coating, is dishwasher safe and has sufficient depth for cooking more than just fry-ups. Sadly, it’s not induction hob compatible. The key question we asked in our user survey was this: “You’ve been using your pan for three months or more. Given your experience to date, how would you rate your pan overall on a scale of 1 (low) to 10 (high)? Think about you food results, durability of construction, ease of cleaning and value for money”. We then took all these ratings for a given model and found an Overall Users Satisfaction Rating per model. A best buy frying pan will have a score of 8 or more. A score of 7 suggests a good design marred by poor reliability. A score of less than 7 suggests a product has both design and reliability faults. It’s probably a waste of your money. A guide at the time of publishing. This is based on a 24cms fry pan. Smaller diameter pans will cost less, larger pans proportionately more. If you go bigger than 24cms make sure the pan won’t spill over onto other hobs on your cooker. The pans in our top 10 are made of aluminium, anodised (hardened) aluminium or steel sealed with hard enamel paint on the outside. Aluminium heats uniformly across the base and sides. All the top 10 frying pans here work with gas, electric and halogen hobs. If you are using an induction hob you are cooking with magnetism! The induction causes magnetic friction in the pan’s metal and heats it up – yet the hob remains relatively cool. To work on an induction hob a frying pan needs a base made of steel which is magnetic. Aluminium is not magnetic. A popular aluminium pan like the Tefal Sensorelle won’t work on an induction hob. Some aluminium frying pans have steel incorporated into their base. That’s why the Castey Vulcano or Le Creuset work with induction hobs. A solid, raised hob range like an Aga requires the base of the frying pan to be flat on the hob. All the top 10 pans here have flat bases. Eg Teflon coating. It resists food sticking and so burning, making it easier to clean a pan after use. Adds utility to a pan as you can bake or grill the contents without worrying about sticky out or very hot handles. You can bake or grill the contents of the pan. The handle will not melt – but it will get hot – beware. You pay a premium for a lid. The alternative is a splatter guard. The Clean Zone Silicone splatter guard performs the roles of guard, lid and trivet. If you have a non-stick frying pan you can practice dry frying with the right foods. For example you might fry bacon without adding oil (if you are lucky). This pan is generally OK to put in a dishwasher. When you’ve compared frying pans you’ll want the best at the right price. We can guide you to the right solution for you frying, griddling or sautéing needs. So rustle up a bargain omelette baking, quick fry-up, sauce mixing or stir frying marvel with the help of the Best Buys Compared UK price search service (check out “who’s cheapest” on the navigation bar above or below). 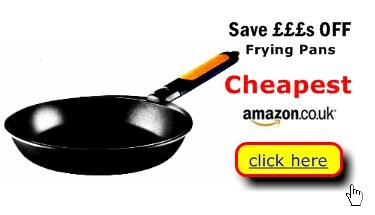 Thank you for using our UK frying pan comparison table.